Above right are photos of B&O / Bang and Olufsen S-75 speakers that have their crossovers burned to a crisp, and oddly still function to a fair degree. We have seen this on a couple of other pair. We have purchased about 4 vintage / original pair over the last 12 years. One pair for ourselves. The first pair we purchased years ago, I have personally. The next pair, did function, but we found their sound was slightly different, one from the other after some CAREFUL and DETAILED listening, side by side with pink noise. After testing all the drivers independently with no appreciable differences, we decided to inspect the crossovers. That's when we were amazed to find charred wires, touching each other internally and burned / melted components. This was likely due to the speakers being connected to amplifiers / receivers that were capable of producing much more output current at 4 ohms than most B&O receivers and obviously connected to receivers / amps that were much more power than the speaker were designed to be use with (operator error, and in no way sheds negative light on B&O speakers). 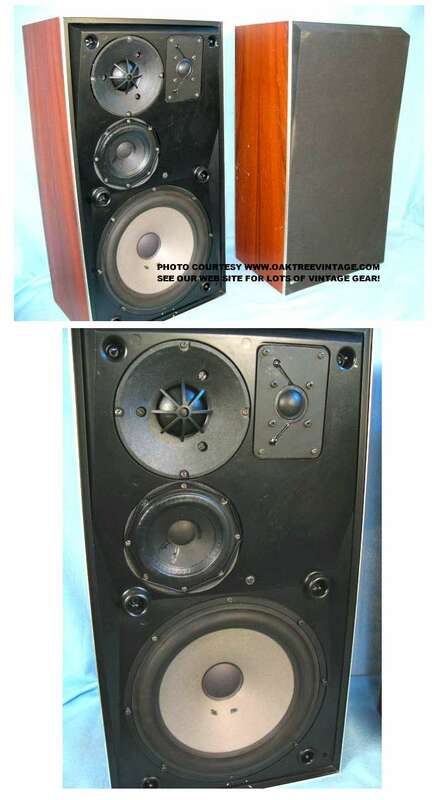 Most vintage / original B&O speakers are rated at 4 ohms, and at 4 ohms, most amps are capable of producing their max current into only the one pair of speakers. Don't ask me how the drivers still functioned connected to those crossovers. We parted them out and didn't think anything else about it, other than how someone had so overpowered a speaker as to "flame" the crossovers. Then the next pair that came in had similar symptoms. We had forgotten about the crossovers on the first pair, and did all the tests again. We then pulled the woofers and found even more badly burned crossovers. At this point I inspected my personal pair, for fear of a fire hazard. Mine were fine, however I am going to replace the very flammable wool, hair, shredded cloth internal batting with non-flammable insulation. The forth pair that has come in has the same problem with the crossovers. According to our math, that's a 75% failure rate! Just FYI when you're out there buying speakers from the "wanna-be's" on the auctions, saying that their "speaker tests fine" and is in "mint condition". Yeah, right. While we have seen crossovers in other brands / models of speakers damaged due to overpowering, overheating, abuse, accidents, it's typically evidenced by exploded capacitors or broken / burned traces, or fatigued solder joints. We also see coils that have come loose from their moorings, but never anything this catastrophic. This is only a problem we are aware of in the original / vintage S-75 models, but it may be known in other models as well. This is not a slam on B&O speakers, but a warning as to their 'mis-use' with amplifiers that are too large, or certainly larger than they were designed to be use with. The B&O, S75's are great sounding speakers by design when used correctly. NEW INFORMATION: Since originally posting this we have received numerous phone calls from recent buyers of not only original / vintage 1970's S-75's, but S-30's, S-45's and S-80's (S-80's are 8-ohms) alerting us that they have the same issues. Virtually none of them knew the history on the speakers, but you can guess they were all connected to a power source that was pushed beyond the capabilities of the B&O crossovers.